Whether you are trying to get a smaller waist to get an hourglass figure, or you are just looking to lose a few inches off of a round belly, these tips and exercises can get the job done. The most important thing to understand when trying to get a small waist is that a healthy bodyweight is priority one; strength training for the entire body & a healthy diet are key. These exercises can also help with a stronger core & more toned abs. Jumping Oblique Twist – This is a great cardio move to help burn calories, minimize belly fat and tone the sides. Oblique moves like this one create muscles that pull your body inwards, creating the look that you're after. The Russian Twist – The twisting motion of this exercise whittles your middle by firming the muscles on your sides; giving you a toned, smaller midsection. The jumping around also bumps up your caloric burn, which is important for maintaining a healthy bodyweight. Pilates Side Plank with Leg Raise – This is a challenging, effective exercise for the entire core; you will immediately feel your sides and obliques working. There are multiple levels of difficulty for this move; choose the one that you can do with perfect form. Crisscross Crunches – One of the best ways to tone your stomach and see results fast. This is an exercise that burns a good deal of calories, due to all of the large muscles groups involved; your whole body has to chip in to create this motion. Windshield Wipers – A good beginner obliques exercise that improves range of motion around the torso. You can make this one harder by straightening your legs, but only attempt that modification if you already have a solid foundation of core strength. Do 30-60 minutes of cardio at least 5 days a week - Regular cardio will keep your heart healthy, and make it easier to maintain a healthy bodyweight, which is absolutely essential to having abs or a thin midsection. Also, if you focus only on working out or doing situps and don't make the necessary modifications to your diet, you will likely never see the results of all of your hard work show up in the form of a toned belly. Make sure that you are not overeating or consuming more calories than you are burning each day (talk to your doctor or a nutritionist about how many you should be aiming to consume each day, or try wearing a calorie counting device in order to get an idea of your daily expenditure). Strength Train - Strength training is a serious ally when it comes to lowering body fat and getting a toned belly - you can't spot reduce fat, but lean muscle can help you maintain a healthy body fat percentage. 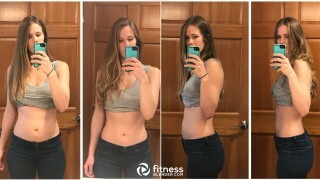 Pull in your stomach - Increase your overall body awareness; stand up straight and keep your abs pulled in tight and it will make an immediate and long term difference in how toned and flat your stomach is. Avoid excess sodium and carbonated drinks - Extra sodium in your diet can make you retain water and swell (read Getting Rid of Water Weight). An easy rule to avoid extra salt is to eat packaged, processed food as little as possible. If you want to get a toned, tight midsection, keeping a well balanced diet has a twofold benefit; it will keep you at a healthy weight long term, and reduce the chances of retaining water weight. Smart, time saving workouts that ask for just 30 minutes of your day to improve your health and your body. 30 Minutes is 1/48th of your day; you can do this!